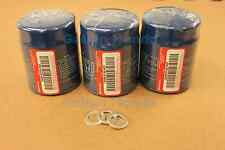 Mazda OEM Aluminum Oil Drain Plug Gasket 9956-41400 LOT OF 5. 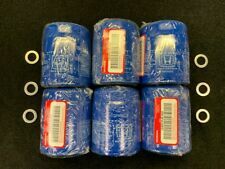 Part# 15400-RTA-003 Oil Filter (Quantity 3). All Honda Models. GENUINE FACTORY OEM. We make every effort to represent what these parts are and what vehicles they fit. Galpin Honda wants to be sure you are getting the item you want or need. Six new, Genuine Honda oil filters with drain plug gaskets. Fits all Honda'sexceptS2000 since 1988. ACURA ILX RDX RSX RL TL TSX. Buy with confidenc e! We are a Honda new car dealer with over 30 years in the Baltimore Maryland market. Cross Reference number for this AC CABIN air filter: C35519 (PUROLATOR NUMBER). A/C CABIN AIR FILTERFOR HONDA &ACURA VEHICLE. WE ARE HAPPY TO ASSIST YOU CHOOSE THE RIGHT FILTER FOR YOUR CAR 24/7. We also have lots of high quality filters for your another cars in affordable price with high quality. 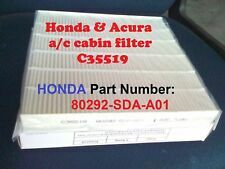 5 out of 5 stars - For HONDA ACCORD CABIN AIR FILTER Acura Civic CRV Odyssey C35519 HIGH QUALITY!! 188 product ratings188 product ratings - For HONDA ACCORD CABIN AIR FILTER Acura Civic CRV Odyssey C35519 HIGH QUALITY!! 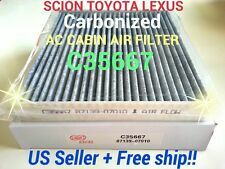 CARBONIZED A/C CABIN AIR FILTERFOR SCION, TOYOTA & LEXUS VEHICLE. Cross Reference number for this AC Cabin air filter: C35667 (Purolator Number). WE ARE HAPPY TO ASSIST YOU CHOOSE THE RIGHT FILTER FOR YOUR CAR 24/7. It fits 2002-2006 Toyota Camry both 4cyl & 6cyl, 2004-2010 for both Sienna & Solara :2002-2003 Lexus ES300; 20004-2006 ES330; 2004-2006 RX330;2007-2009 RX350. Engine air filter and Cabin filter. Cross Reference number for this AF5432 AND CABIN C35479 filter: VA5432: CA9360: A9010: PZA263: VA163. 2005-2015 Toyota Avalon. 2007-2015 Toyota Camry. 2009-2015 Toyota Corolla. 2008-2015 Toyota Highlander. 2008-2015 Toyota Land Cruiser. 2009-2013 Toyota Matrix. 2010-2015 Toyota Prius. 2006-2015 Toyota RAV4. 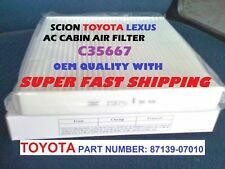 HIGH QUALITY A/C CABIN AIR FILTER FOR Cross Reference number for this AC Cabin air filter:C35519 (Purolator Number). MANY HONDA & ACURA VEHICLES. WE ARE HAPPY TO ASSIST YOU CHOOSE THE RIGHT FILTER FOR YOUR CAR 24/7. These fit 2007-2017 Toyota Camry 4 cylinders & 2009-2016 Toyota Venza 4 cylinders. ENGINE AIR FILTER AND CABIN FILTER. WE ARE HAPPY TO ASSIST YOU CHOOSE THE RIGHT FILTER FOR YOUR CAR 24/7. We are always here to help you 24/7. 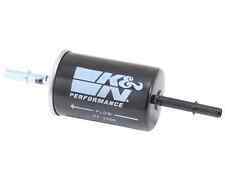 UNIVERSAL INLINE PLASTIC GAS FUEL FILTER Size: 5/16 " 4" LENGTH. FUEL FILTER CAN BE USED FOR TRACTORS,CARS, TRUCKS, MOTORCYCLES, RV'S AND ANY GAS POWERED ENGINE. SEE THRU DESIGN ALLOWS YOU TO SEE IF GAS IS FLOWING THRU THE FILTER. Cross Reference number for this AC CABIN air filter: C35519 (PUROLATOR NUMBER). CARBONIZED A/C CABIN AIR FILTERFOR HONDA &ACURA VEHICLE. WE ARE HAPPY TO ASSIST YOU CHOOSE THE RIGHT FILTER FOR YOUR CAR 24/7. 1995-2017 Hyundai Accent. 1992-2017 Hyundai Elantra. 2014 Hyundai Elantra Coupe. 2014-2017 Hyundai Elantra GT. 1986-1994 Hyundai Excel. 2010-2014 Hyundai Genesis Coupe. 2001-2017 Hyundai Santa Fe. 1992-2017 Hyundai Sonata. 2009-2011 Toyota Venza 6 cylinders engine. 2007-2012 Lexus ES350. 2008-2015 Scion xB. 2006-2012 Toyota Rav4. Combo Set! Engine and Cabin filter. Best price! Save more money! These are superior to any aluminum style cup. Perfect fit into a D size Maglite housing. Each cup is. 750" long and slightly nest into one another for a perfect seal. These are strong, lightweight (0.6 ounces each) and corrosion resistant. $PART NO CNF747(3)WS APPLICATION 96 - 97 HYUNDAI ACCENT 1.5L 1495CC L4 DOHC 95 - 02 HYUNDAI ACCENT 1.5L 1495CC L4 SOHC 12 - 14 HYUNDAI ACCENT 1.6L 1591CC 97CU. IN. L4 DOHC 06 - 11 HYUNDAI ACCENT 1.6L 1599CC L4 DOHC 01 - 05 HYUNDAI ACCENT 1.6L 1600CC L4 DOHC 92 - 95 HYUNDAI ELANTRA 1.6L 1596CC L4 DOHC 96 - 97 HYUNDAI ELANTRA 1.8L 1795CC L4 DOHC 98 - 98 HYUNDAI ELANTRA 1.8L 1796CC L4 DOHC 15 - 15 HYUNDAI ELANTRA 1.8L 1797CC 110CU. IN. L4 DOHC 11 - 15 HYUNDAI ELANTRA 1.8L 1797CC L4 DOHC 93 - 95 HYUNDAI ELANTRA 1.8L 1836CC L4 DOHC 99 - 12 HYUNDAI ELANTRA 2.0L 1975CC L4 DOHC 14 - 15 HYUNDAI ELANTRA 2.0L 1999CC L4 DOHC 13 - 13 HYUNDAI ELANTRA COUPE 1.8L 1797CC L4 DOHC 14 - 14 HYUNDAI ELANTRA COUPE 2.0L 1999CC L4 DOHC 13 - 13 HYUNDAI ELANTRA GT 1.8L 1797CC L4 DOHC 14 - 14 HYUNDAI ELANTRA GT 2.0L 1999CC L4 DOHC 86 - 94 HYUNDAI EXCEL 1. XV CROSSTREK & HYBRID 13-17. WRX STI 13-16. IMPREZA WRX 08-16. --> FORESTER 09-17. IMPREZA 09-16. IMPREZA OUTBACK 08-11. A/C CABIN AIR FILTER. WE ARE HAPPY TO ASSIST YOU CHOOSE THE RIGHT FILTER FOR YOUR CAR 24/7. 2011-2016 SCION TC (4CYLINDER ENGINE ONLY). 2005-2018 TOYOTA AVALON (V6 ENGINE ONLY). 2007-2018 TOYOTA CAMRY (V6 ENGINE ONLY). 2012-2017 TOYOTA CAMRY (4CYLINDER ENGINE ONLY). 2009-2018 TOYOTA HIGHLANDER (4CYLINDER ENGINE ONLY). Air Filter Shape: Round Tapered. Product Style: Round Tapered Universal Air Filter. K&N clamp-on universal air filters are washable and reusable. Clamp-on washable and reusable air filter. Filter Material: Cotton Gauze. AF5655 fits. Yaris 06-18. Scion xD 08-14. Toyota Corolla 09-18 1.8L only. Corolla IM. Pontiac Vibe 1.8L (09-10). Matrix 09-13 1.8L only. WE ARE HAPPY TO ASSIST YOU CHOOSE THE RIGHT FILTER FOR YOUR CAR 24/7. Mazda3 SkyActiv Only! Mazda6 2014-2016. ENGINE & CABIN AIR FILTER (AF6280 & C38175). WE ARE HAPPY TO ASSIST YOU CHOOSE THE RIGHT FILTER FOR YOUR CAR 24/7. We are always here to help you 24/7. We also have lots of high quality filters for your another cars in affordable price with high quality. 2004-2010 for both Sienna & Solara 2002-2006 Toyota Camry both 4cyl & 6cyl. 2007-2010 Camry Hybrid;. 2002-2003 Lexus ES300;. TOYOTA PART NUMBER : 17801-OH010. WE ARE HAPPY TO ASSIST YOU CHOOSE THE RIGHT FILTER FOR YOUR CAR 24/7. BMW HIGH PERFORMANCE 5w30 Synthetic Engine Motor Oil-12 Quarts. GENUINE BMW HIGH PERFORMANCE 5w30 Synthetic Engine Oil 83-21-2-365-946. 5 out of 5 stars - BMW HIGH PERFORMANCE 5w30 Synthetic Engine Motor Oil-12 Quarts. 8 product ratings8 product ratings - BMW HIGH PERFORMANCE 5w30 Synthetic Engine Motor Oil-12 Quarts. CABIN AIR FILTER and ENGINE AIR FILTER FOR 2003-2008 TOYOTA COROLLA AND 2003-2008 TOYOTA MATRIX. WE ARE HAPPY TO ASSIST YOU CHOOSE THE RIGHT FILTER FOR YOUR CAR 24/7. We are always here to help you 24/7. Part Number: 80292-SDA-407. 2017 - 2015. 2008 - 2004. 2016 - 2009. 2016 - 2013. 2015 - 2012. (1) Subaru 16546AA12A. 2005-2017 Subaru Outback. 2008-2016 Subaru Impreza. 2005-2017 Subaru Legacy. 2013-2016 Subaru Crosstrek. 2007-2017 Subaru Forester. 2006-2014 Subaru Tribeca. ACURA TSX, RSX, RL, MDX, ILX. 1 SINGLE NEW GENUINE HONDA ENGINE OIL FILTER. We are a Honda new car dealer with over 30 years in the Baltimore Maryland market. We have a large inventory of Genuine Honda Parts! It fits 2003-2008 Toyota both Corolla & Matrix Scion TC 2005-2010. Pontiac Vibe 2003-2008. Scion FR-S 2013-2016. WE ARE HAPPY TO ASSIST YOU CHOOSE THE RIGHT FILTER FOR YOUR CAR 24/7. Subaru BRZ 2013-2018. All Genuine Toyota Oil Filters Incorporate an anti-drainback valve, to prevent oil from draining back into the oilpan when the engine is not running, thus maximizing engine life. These are case quantities of 10 units per case. Dodge Ram 6.7 Liter Diesel Fuel FilterS Rear Water Separator Mopar OEM. 2013-2017 DODGE RAM 2500WITH-- 6.7L DIESEL. 2013-2017 DODGE RAM 3500WITH-- 6.7L DIESEL. 2013-2017 DODGE RAM 4500WITH-- 6.7L DIESEL. 7-Quarts Genuine BMW 5w30 Synthetic Motor Oil. 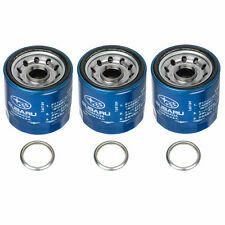 & 1- Mann Oil Filter HU925/4x. For USA Model Vehicles. 2001-2002 2.5L; 3.0L. 1999-2000 2.5L; 2.8L. 1998 E36; 2.8L. 1997 E36; M52; 2.8L. 2001-2006 E53; 3.0i; M54. Toyota Lexus OEM Cabin Filter. 2011-2015 Lexus CT200h. 2013-2014 Lexus ES300h. 2007-2016 Lexus ES350. Toyota factory warranty. 2006 Lexus GS300. 2007-2011 Lexus GS350. 2006-2007 Lexus GS430. Genuine Honda / Acura. Fits: All Honda Models except S2000. Genuine OEM - direct fit. Provides quality engine effectiveness. FITS 86 - 17 HYUNDAI / KIA. 86 - 94HYUNDAI EXCEL 1.5L 1468CC L4 SOHC. 10PCS WASHERS. 10PCS GENUINE ENGINE OIL FILTERS. - included washers. - Genuine Parts Product. 12 - 15KIA SOUL 2.0L 1999CC 122CU. 10 - 11KIA SOUL 2.0L 1975CC L4 DOHC. Acura TLX 2.5L 15-18. 2.4L. 13-17. Value Combo Set! WE ARE HAPPY TO ASSIST YOU CHOOSE THE RIGHT FILTER FOR YOUR CAR 24/7. We are always here to help you 24/7. We also have lots of high quality filters for your another cars in affordable price with high quality. 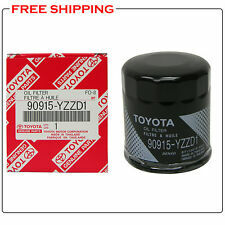 1 x 1562031060 GENUINE TOYOTA. C35865 A/C CABIN AIR FILTER FOR - Hyundai Veloster (2012-2015). - Kia Rondo (2007-2013). - Hyundai Accent (2012-2015). - Kia Forte (2010-2013). - Kia Forte Koup (2010-2013). - Hyundai Genesis Coupe (2010-2015).